Crafted by Lindy was one of the first shops that I gave a heart to on Etsy. 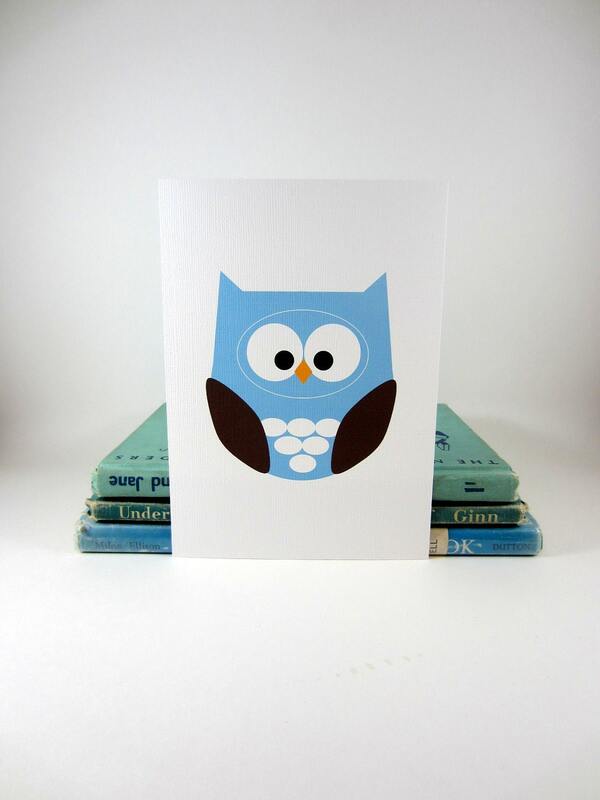 Her cards and paper products have such a clean, crisp look and have a cute factor of 10/10. If you like clean, modern art with plenty of colour, this is the place to find it. My name is Lindy and I come from a very creative family. Both of my parents are artists and my dad worked in the Art Gallery at the University of Lethbridge. I grew up in a very creative atmosphere and ended up getting a fine arts degree in technical theatre from U of L. I then got married and moved to Calgary where I went through a couple of jobs and had three kids. 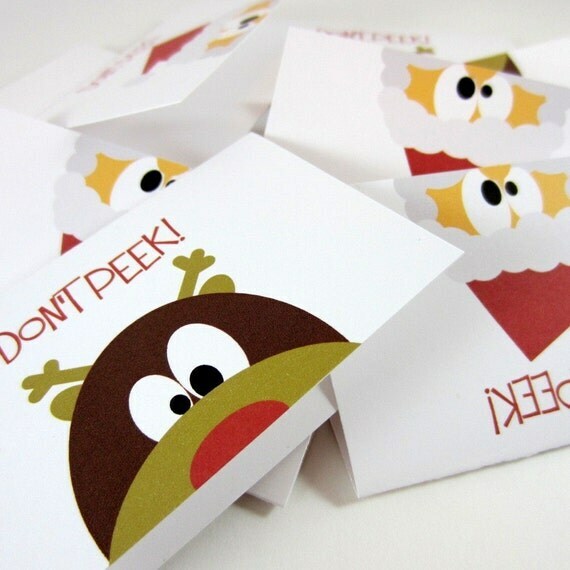 I stayed creative by making cards. Paper was the one media I kept going back too. I started to play around with designing images on the computer and went from a more scrapbook like card to a digital version which is what you see in my Etsy shop. While I enjoyed making cards I always felt like I needed a purpose. It was hard for me to just sit down and make a card just for the fun of it. I had to have a reason for doing it. I found Etsy shortly after having my first son. I missed working and thought selling cards on Etsy might fill that need. I worked on some digital images and opened my shop in February of 2009. 3. Show us a few of your favourite pieces and why they are your favourites. Oh this is hard! I like everything! I think it’s important to really like what you sell. I think customers can feel that through your shop. But with that said there are a few that stand out. I love my Owls. They came together very naturally and I just love how they turned out! 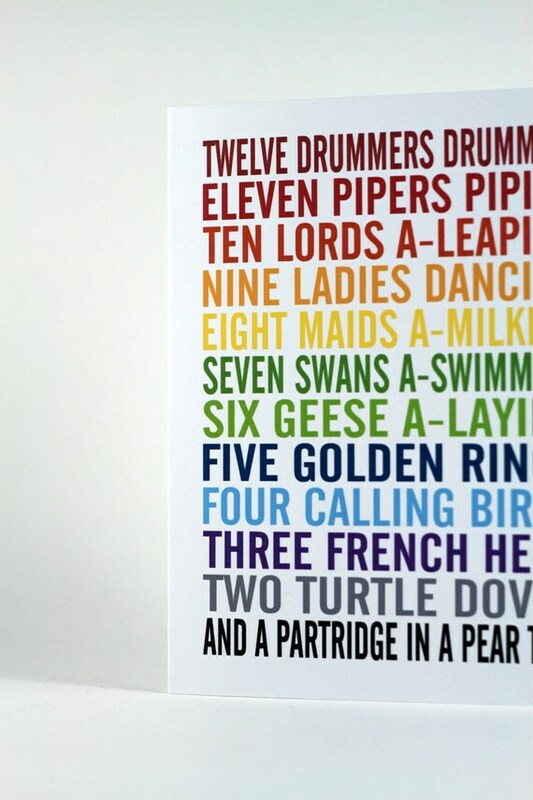 I love this 12 Days of Christmas Card. Again it came together very naturally one day and it’s been really well received. It’s very fun to have make something that you love and then find out that other people love it too! 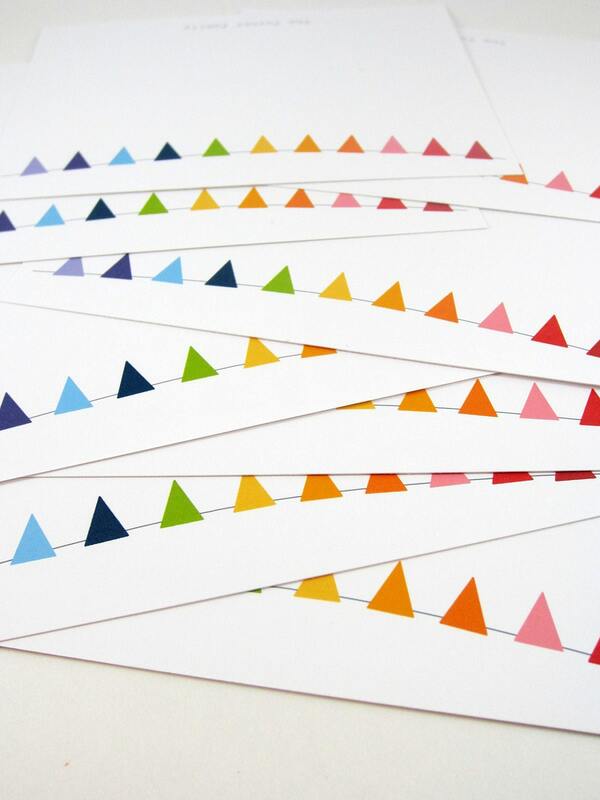 I really like all of the bunting listings in my shop. I love how simple of a design it is but it creates a great visual. I really like my animal wall art prints. They were some of the first images I designed in order to open my shop. I think it’s important as it creates a sense of community and supports the area that you yourself live in but I also think it’s fascinating how a community can for formed from hundreds of sellers all over the world. That’s one of the reasons why I like Etsy so much. 5. Is there any one moment or experience in developing your art or your business that stands out in your mind? Why? Hitting 700 sales probably. I have no idea why. You’d think hitting 1000 would be more thrilling and it was but for some reason I went crazy when I saw the number go past 700. Go figure! I’m just thrilled that I’m able to do something I love and that my cards and prints are finding new homes all over the world. Thank you, Lindy, for sharing some of your story with us! I tried a Faux Piped Binding tutorial from Thread Tales from a Scrappy Quilter and although the tutorial didn't specify any instructions for the corners, it turned out pretty great. I've been looking for ways to completely do my bindings with machine stitching and this is a great technique to do that. 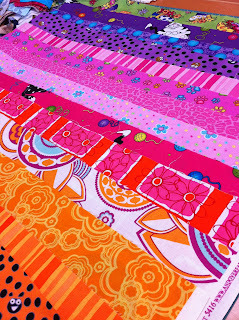 From the piping fabric, you need to cut and piece 1 5/8" strips the length you would normally cut your bindings (perimeter of quilt plus about 6-8"). 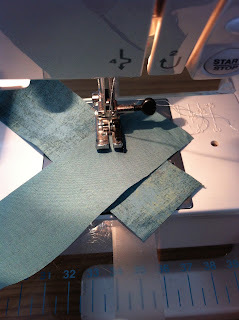 From the binding fabric, you will need to cut 1 3/8" strips the same length as your piping fabric. 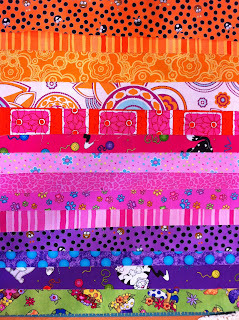 Join strips with a diagonal seam to reduce bulk and when you have the correct lengths, sew together along the long edge to make a 2-color strip. I pressed the seams open and then pressed it in half. 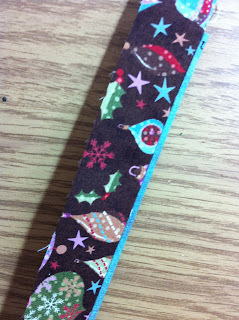 That meant the seam ends up on one side of the strip with a little bit of the blue showing on that side. 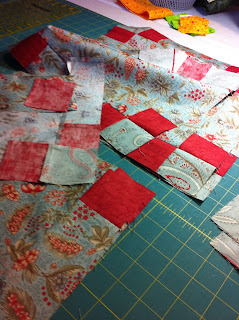 Then, I sewed the pressed binding on the BACK of the quilt same as I would normally do for a single color binding. 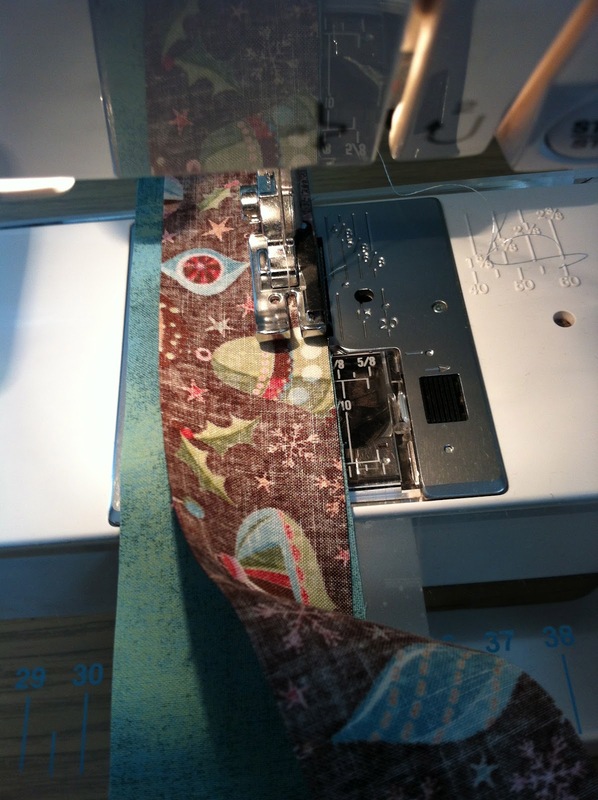 And turned it to the FRONT and set up your machine with thread matching the piping in the top needle and thread matching the backing/binding in the bobbin. 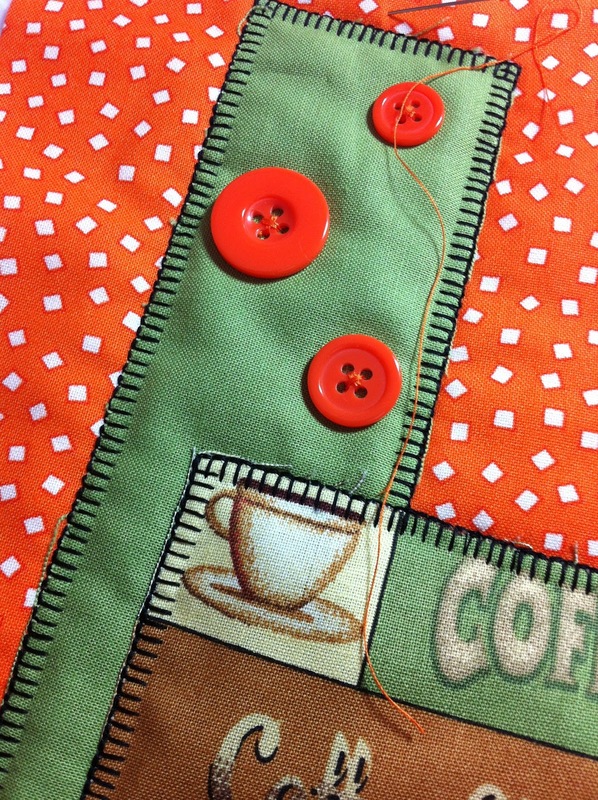 Pin carefully so the seam from the piping is directly over the stitching line you just made when stitching your binding on. Top stitch in the ditch of the seam that joins the piping fabric to the binding fabric. 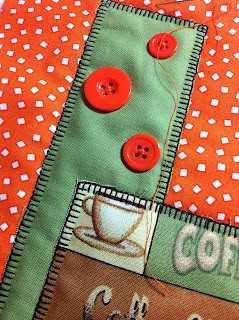 You can sew a few inches and see what the seam looks like on the back - it should be just off the binding, but don't worry if it's not perfect the first time - it will get better with practice! And this little table runner is finished! 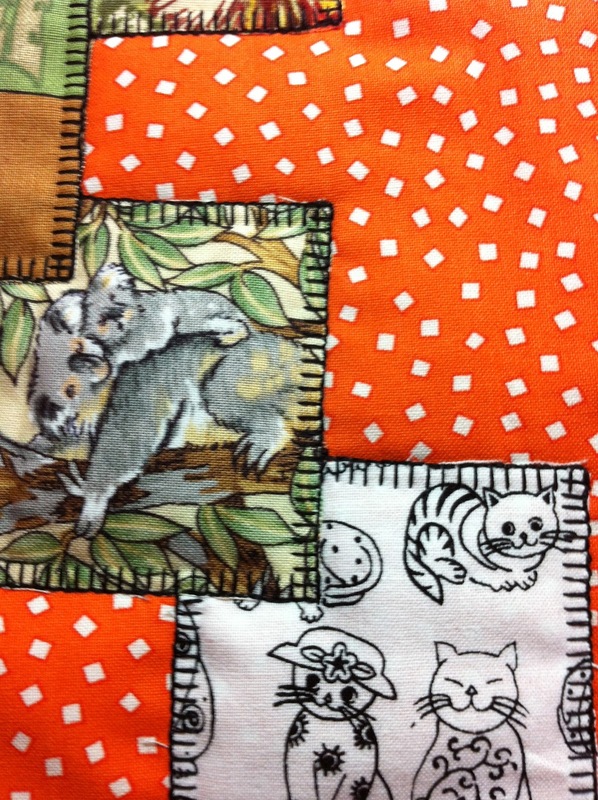 This took a little longer than I thought, but I was worried about how the stitch would look on the back-side. I caught the binding a bit more than I wanted, but it is a technique I will be trying again. What new techniques have you tried lately? Shopping for the holidays happens for me the whole year round. 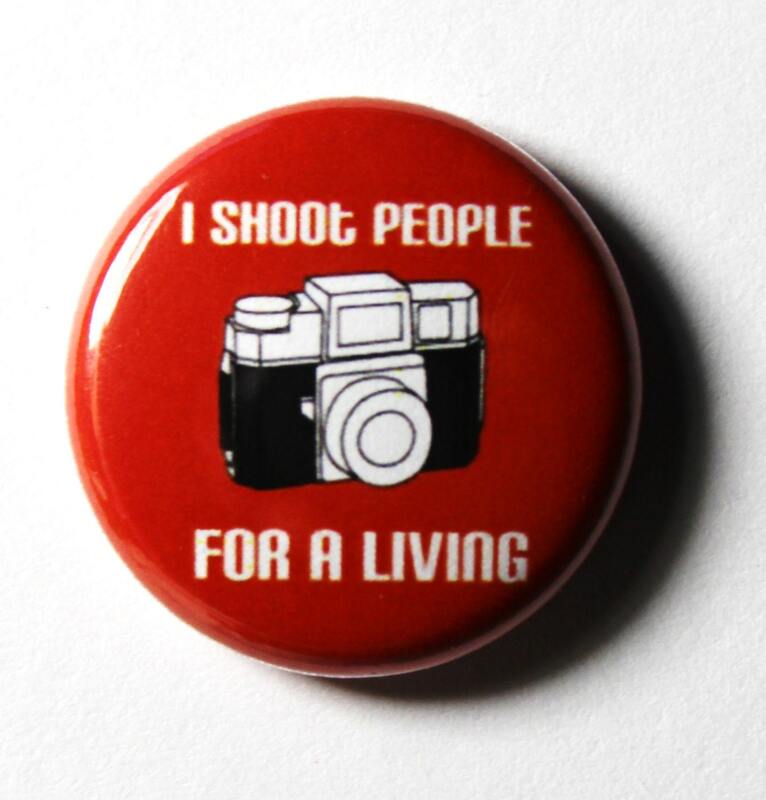 When we travel, I'm always on the look out for locally made items that I can gift for birthdays or Christmas. Through my online shop on Etsy, I've discovered all kinds of local Alberta talent and over the next few months, I will introduce you to some of my favourites. Today, I'd like to introduce you to Bonnie and her shop, Stufd. I have ALWAYS been a crafty lady, love painting, crocheting, scrapbooking, sewing, any crafts! 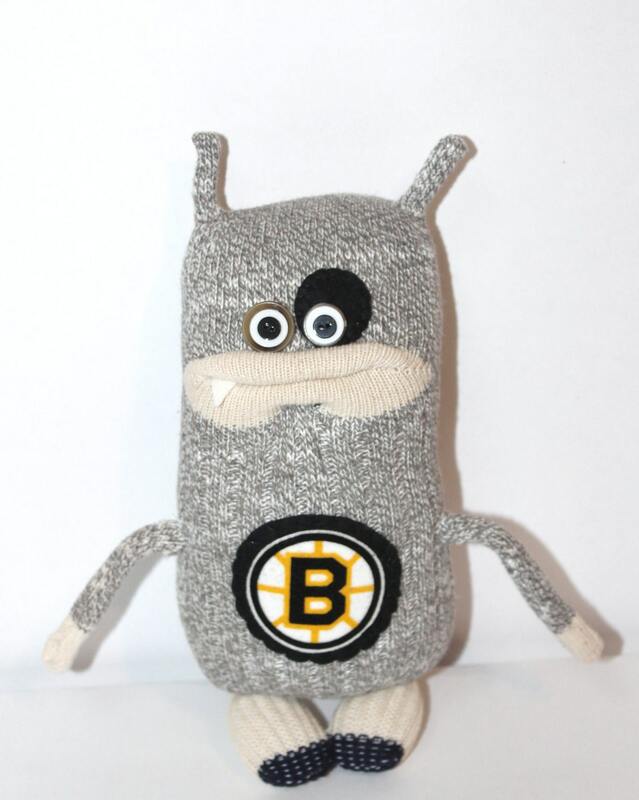 In January of 2009 I started out making a few little sock buddies, just as a hobby, and I haven't quit since. Their interesting characteristics, names, and stories have taken over, and leave me daydreaming about them morning, noon, and night! I love the reaction and smiles I get from people when they squeeze a little monster :)They are truly unique and fun. I decided to try out a market in Innisfail, my home town, and then moved on to a few bigger markets from there. I never personally thought of selling them, but I had the odd request after posted a few pics on facebook, which then lead to the odd market, Christmas markets, and Etsy! My current monster count is around 1800 or so, and I have had ALOT of favorites. Sometimes faceless incomplete monsters win me over, and I think... I need to keep this. But my darling hubby reminds me that I cannot have a hoard of sock monsters, so currently I have 2 main monster men. Dinnon, was my original.. I cannot let go of this monster. And to this day, I am so sad to say that I lost him I took him to Invermere with me a couple of New Years ago, and I think at a pit stop in Canmore at Tim Hortons, he jumped out of the car. Must have seen a mountain sheep or something, and I haven’t seen him since. 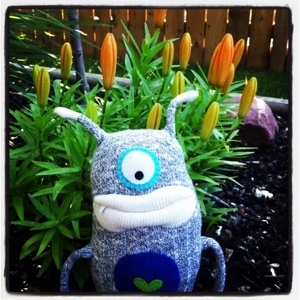 Sherman is now my main monster man, and travels with me most places You can read about his adventures on my blog. 4. What does shop local mean to you and why is it important? 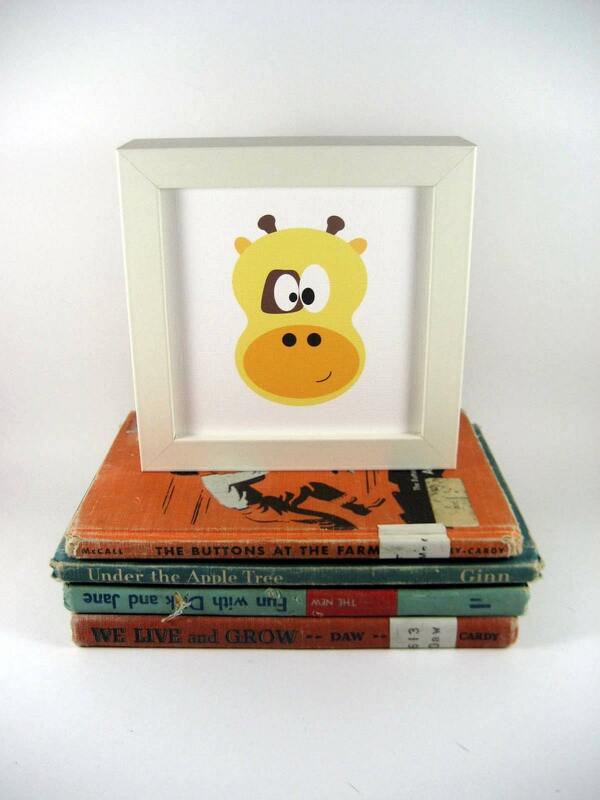 Buying handmade and supporting local talent is extremely important, and I try to do it as much as I can! They are unique items that you will not find at a local chain store. Alot of artisans, myself included, cannot compete with big stores such as walmart, but our products are by far more superior for quality, with great attention to detail. Buying local, handmade items supports your community, it’s more environmentally friendly, and not to mention you are getting unique personalized gifts. 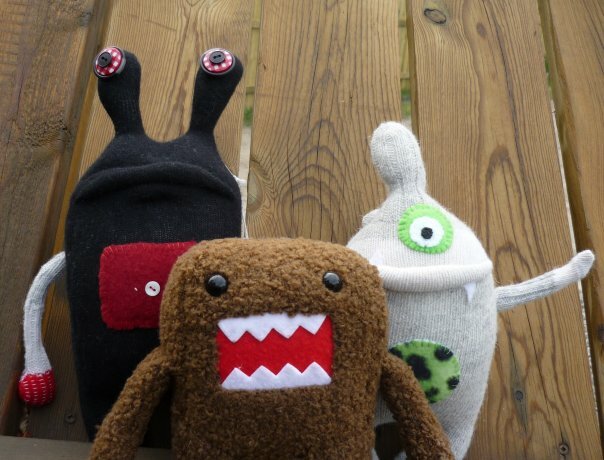 The first market I attended in Red Deer, I sold 6 monsters, and it was awesome! It’s a great feeling when you find that people love your work as much as you do. I was NERVOUS, but my sister came with me. Everything about the day was awesome! 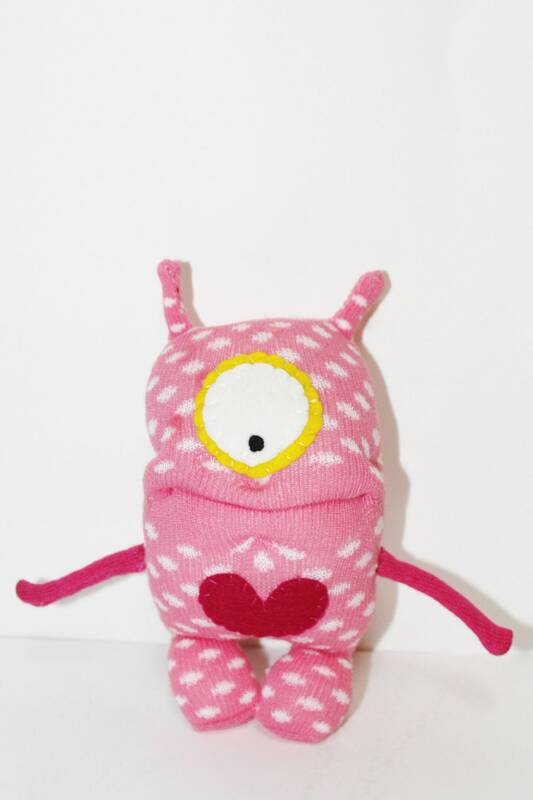 My favorite market story... is when a dad and his 2 kids were at my table browsing at monsters, when the dad picked up a little red striped guy and said, we will get this one for your baby (brother) I believe. As I was putting the monster in the bag, I introduced his monster to him and said... your monsters name is Stan. And he looked at me funny and said.. my name is Stan. ha Guess they were meant to be! Every market I do, is an awesome experience. I get great feedback, and I have met sooooo many awesome people! It is way more fun than my day job! My hubby also does markets and sales with me, so it’s awesome to spend that extra time together, and he enjoys it just as much as I do. NOTE: Bonnie has a second shop, SNOTTUB, where she sells cute little buttons (or magnets) with incredibly cute & funny statements. Thanks, Bonnie for sharing a little about your story with us! Aaahhh! It feels so good to have a bit of a schedule back again. 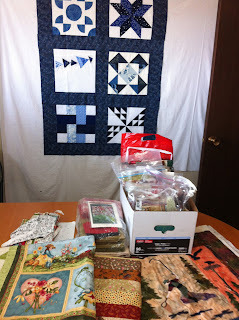 Today was sewing day with two of my best quilting buddies. After a whole summer of not being able to get together, it was great to catch up on the latest and see what everyone was working on. 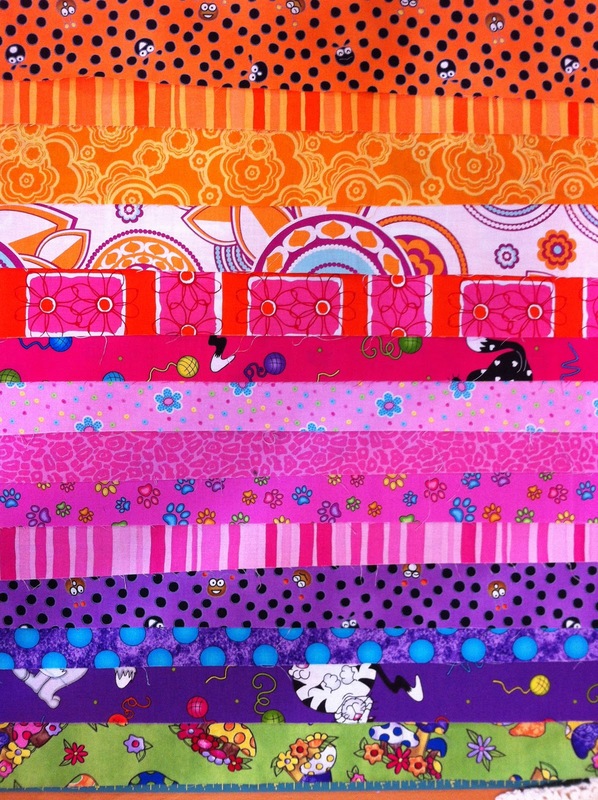 My friend Marie was working on a quilt top that she started on a trip to Seattle last year and the colours and precision piecing on this quilt were absolutely amazing! 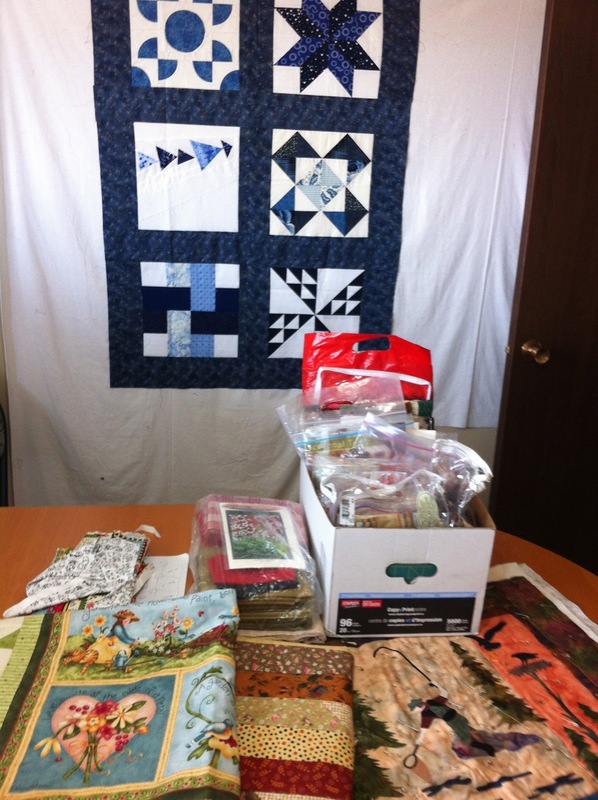 She is one very talented quilter and I am so glad I get to peek at what she's creating. Louise was busy with half-square triangles (she's been doing a lot of them lately!) 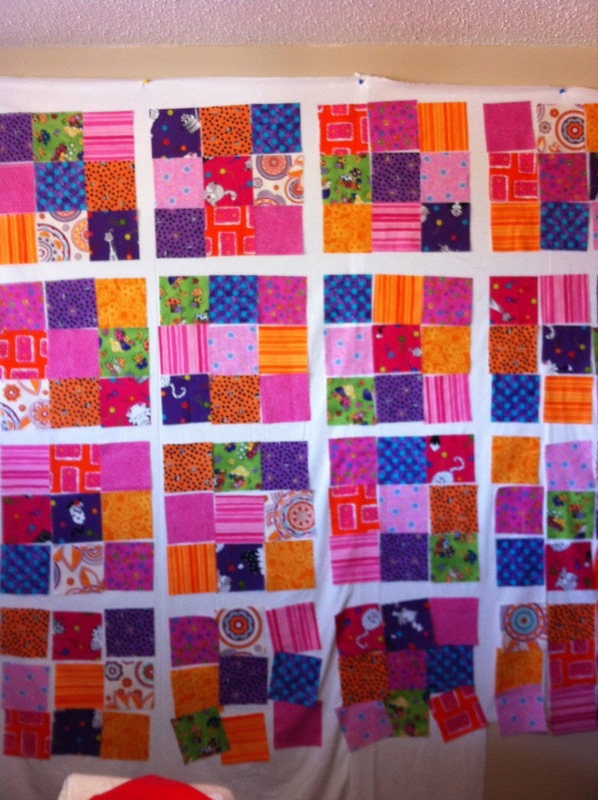 and had a great start on a pair of pillow shams for in her bedroom. 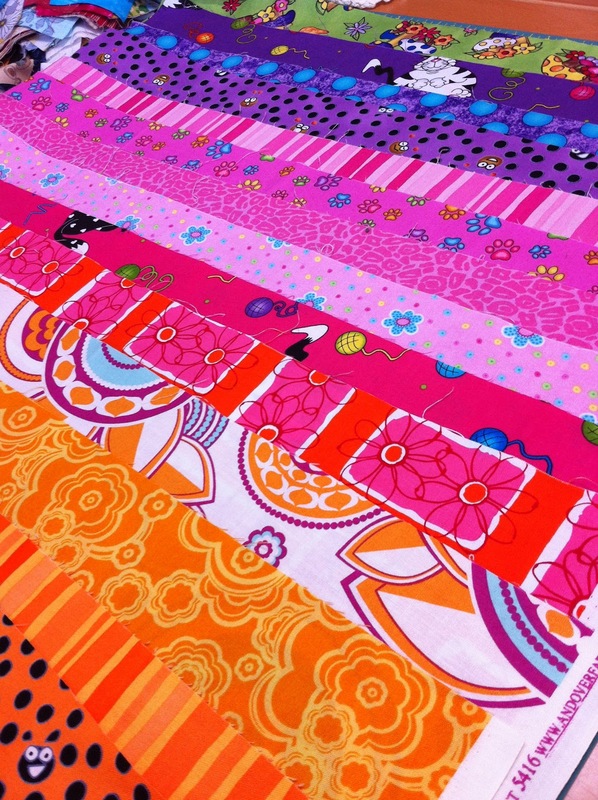 I love her bright colour choices and can't wait to see the bed runner she wants to make next. 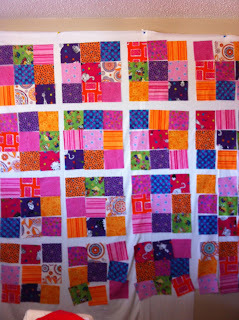 I thought I would complete this quilt top in the morning and have time for starting another quilt this afternoon, but today was not the day that everything fit together easily and I spent a great deal of time ripping out stitches and redoing seams to make everything line up properly. 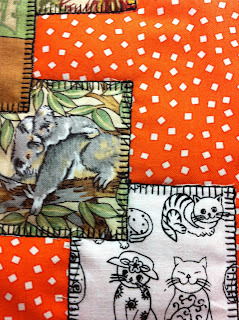 The fabric is an awesome line called Etchings, by 3Sisters from Moda. Out of the way and private in the basement, this room was claimed by our oldest son when we moved here. He change the lighting from fluorescent fixtures in the drop-down ceiling to recessed potlights, added a dimmer switch and painted the trim a beautiful royal blue. When he left for college, the next oldest promptly moved out all his brother's belongings, painted the walls chocolate brown, and moved his stuff in. And life was good and these two found awesome women, got married moved out and are living their happily ever after. 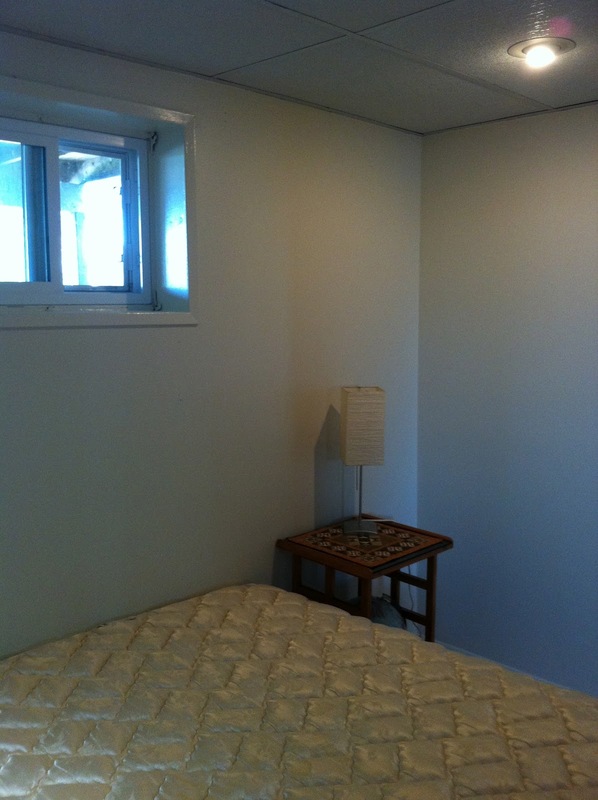 The youngest son was happily living in an upstairs bedroom, but when his messy bedroom became too much to look at on a daily basis, he was moved downstairs into the vacant room while he was away one summer. Because he's a musician in the military reserves, his curtains were made from camo fabric. But this summer he moved out, and, well, some of his stuff went with him, and I took the opportunity to re-do this room into a more permanent guest room space. I still need to work on curtains for the window and for the closet door, but it's a brighter space and we've already had guests here to test it out. It was fun to re-do a space, spending a little on paint, but most of the other decor items were re purposed from other areas of the house. You'll probably see more photos of this space in the future as I plan on using it to photograph my quilts. How about you? 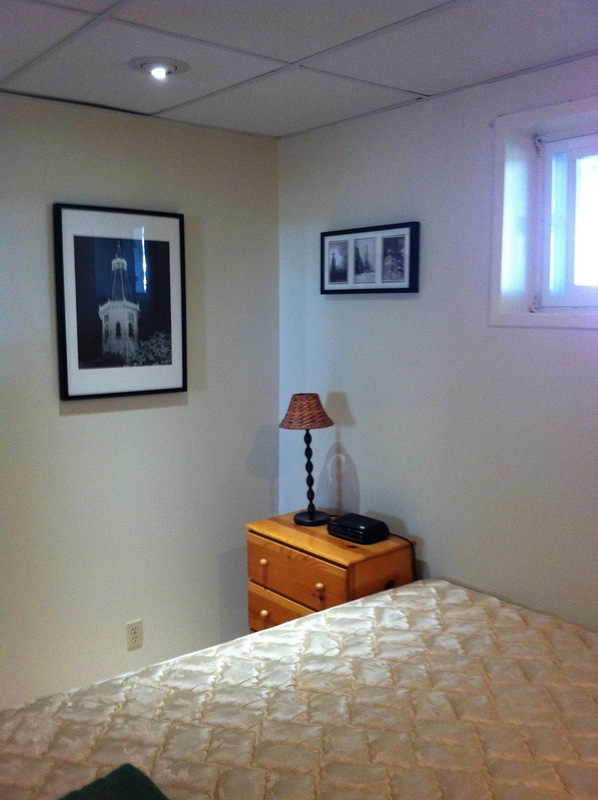 Have you re-done a room in your house? Used what you have in new ways to refresh a space?